One of the MANY things I love about living in East Africa is going to church in the villages!! They all tend to have similar things in common: the cutest kids, joyful worship, and the thick presence of God!! 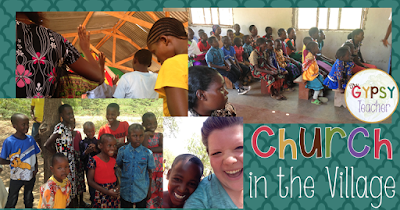 We go to village church once or twice a month, usually, and I love it so much!! Here's some snapshots from our last service! Worship is taken to a whole new level. Though the words may be in a different language (that I'm working to learn! ), the Spirit moves so mightily! The babies here were SO adorable!! I wanted to take one home!! ;) Just kidding, but seriously, I couldn't get enough of these cute faces!! A peek through the church window. When church finishes, we file out of the church and greet each other. We make a circle outside the church, and we greet everyone!! I love this tradition- what a great way to end our time together! There are so many children in this church, which I love! Their smiles are so precious, and I loved spending a few minutes with them. There's a reason why Jesus said... "Let the little children come to me..."
We had to take some selfies too!! My favorite picture of the day. This beauty loved looking at the pictures I was taking, and came up and leaned her head on my shoulder. I had to flip the camera and take a selfie with her!! Make sure you head over to my Instagram and watch the video I posted from this church too!! Such a great day! We serve an AWESOME GOD! IMMERSED in the New Year!